You can find five BrainPOP apps in the App Store. Apps are free to download, and offer in-app purchases, which renew monthly until you choose to cancel. Find out more about our app subscription options below. You can modify or cancel your in-app subscription on your device. On your device, tap Settings > iTunes & App Store. If you're not signed in, sign in with the Apple ID and password that you use with the iTunes Store. Tap View Apple ID. You might be asked to enter your password again. Under Subscriptions, tap the subscription you want to manage. Use the options to manage your subscription. You can choose a different subscription period, or choose Cancel Subscription. To cancel a subscription, turn off Auto-Renewal. Turning off Auto-Renewal cancels your subscription at the end of the current billing cycle. 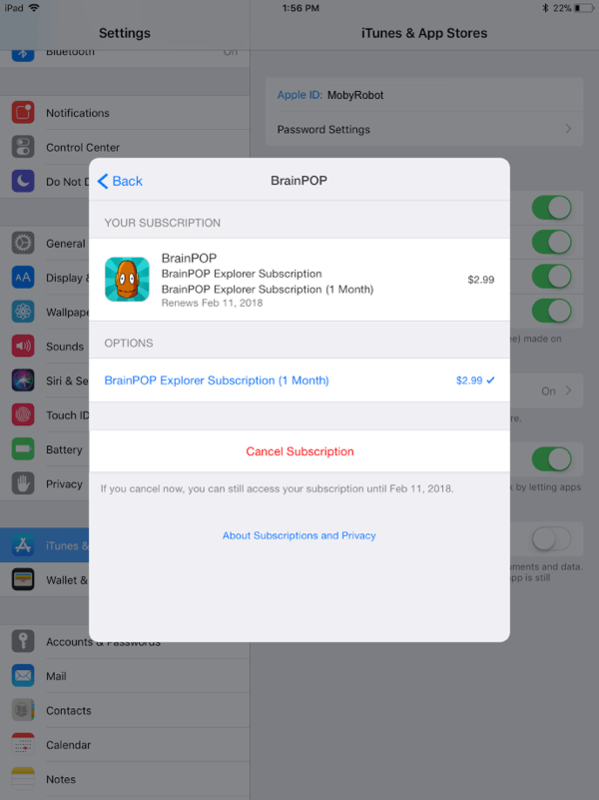 If you were logged out of your Apple ID on your device, or if you would like to access your in-app subscription on a new device, you can restore your in-app subscription to BrainPOP. Apple allows you to link up to three devices to your Apple ID at one time. Can I use my iOS app subscription to access BrainPOP websites? No. In-app subscriptions only have access to the BrainPOP movies and quizzes in the iOS app. If I have a BrainPOP site subscription, can I log in with my username and password to the apps? Yes. With a BrainPOP site subscription, you can download the free iOS app and log in using your site credentials. Does the app track student progress in My BrainPOP? You can log into our apps with your My BrainPOP individual account, but the apps do not track your activity or allow you to view assignments, or submit work or assignments. If you want to access these features on a mobile device, you need to visit our sites on your device’s mobile browser. Does the app track my quiz scores? Yes. High quiz scores are stored locally on the device and can be cleared at any time by going to the BrainPOP app settings on your device and choosing Delete High Scores. However, these scores are not tracked in My BrainPOP. Can I access games, activities or other BrainPOP features on the iOS app? The app only provides access to the movies and quizzes. For our full range of offerings, visit BrainPOP. Why can’t I view or play the movies on the app? For all BrainPOP apps, make sure that your school’s wireless network has *.brainpop.com whitelisted. Can I use Family Sharing with the BrainPOP App? Family Sharing is available for the free versions of our apps. 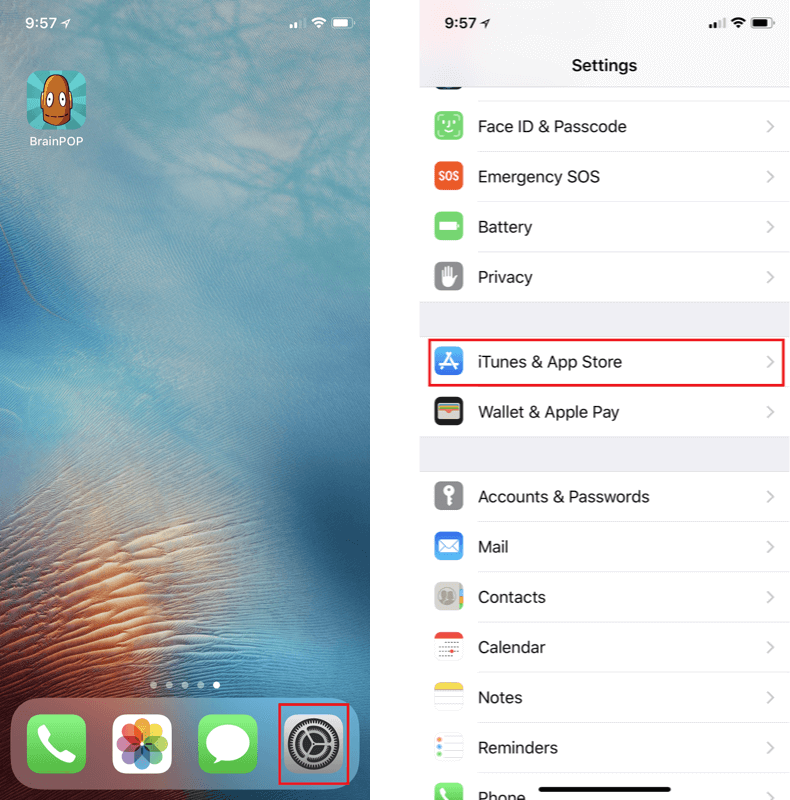 Family Sharing is not compatible with in-app purchases, but you can access your paid subscription on up to three devices using your personal Apple ID. Visit Apple to find what is and what isn't allowed through Family Sharing. Can I use my app subscription on multiple devices? Yes. Apple allows up to three devices registered on each Apple ID. 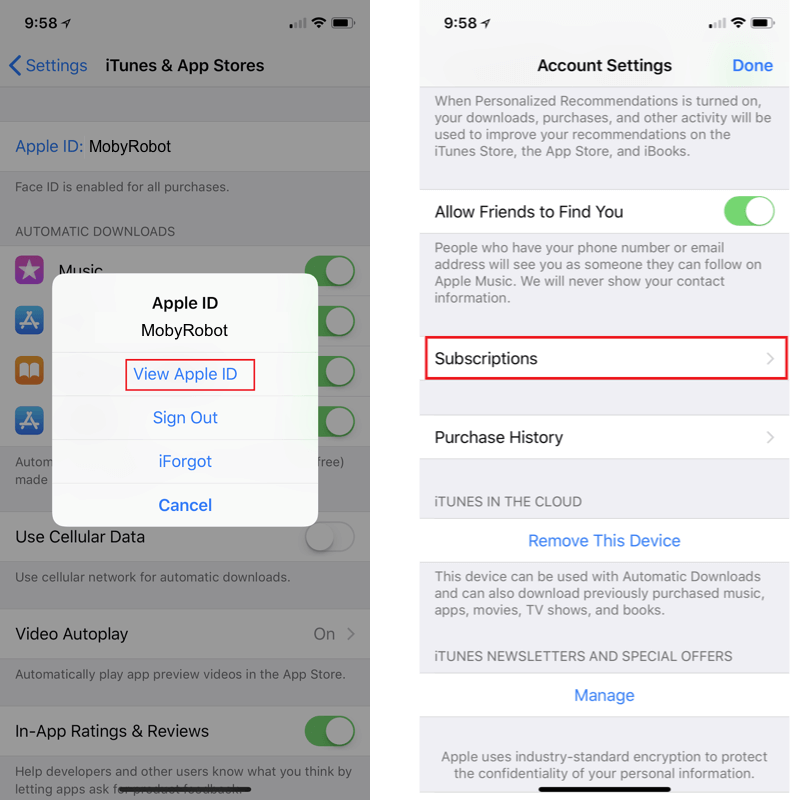 You can restore each device to the Apple ID you used to purchase your app subscription. Open the app and tap Log In in the bottom right corner. Then, tap Restore In-App Purchase. This will allow you to restore your Apple ID and password and reactivate your account. Why is there no sound when the movie plays? Make sure the screen rotate lock switch on the side is not engaged. This can act as a mute button for some apps. Make sure the mute icon (a bell with a line through it) is not highlighted white. You can check this by swiping up from the bottom of the home screen to bring up Apple task bar. Double tap the home button to bring up the task bar. Swipe to the right to see a speaker icon at the far left. Tap the speaker icon to unmute system sounds. Go to Settings > General > Accessibility > AssistiveTouch. Turn ON AssistiveTouch – an icon will appear on the screen. Click anywhere on the screen to exit out of AssistiveTouch menu. If you’re still having trouble, try uninstalling the app, rebooting your device, and re-installing the app.